Ross is a law professor at George Washington University and author of Lessons in Censorship: How Schools and Courts Subvert Students’ First Amendment Rights. 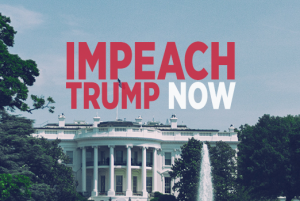 She will be participating in a news conference on Thursday with groups organizing ImpeachDonaldTrumpNow.org that features a petition of 850,000 signers urging Congress to initiate an impeachment investigation into President Trump’s corrupt business dealings. She said today: “President Trump has likely been violating the Constitution since the moment he was inaugurated because he refused to divest himself of ownership of the Trump Organization and all of its businesses and properties. Profits from those business interests, we learned a week ago, are expressly being held for him. This arrangement appears to violate Article II, Section 1 (7) of the Constitution, known as the domestic emoluments clause, which is squarely aimed at preventing presidential corruption, and which has not received sufficient attention in the last few weeks. “President Trump has challenged the rule of law by saying laws about ethics and corruption don’t apply to him — but he can’t say that about the domestic emoluments clause because its language is clear. It applies only to the President. It says that the President ‘shall not receive’ any ‘Emolument’ from the federal government or the government of any state during his term in office, thus limiting the material benefit of his office to his salary. “Emoluments were defined broadly by the dictionaries at the time the Constitution was written. Emoluments are not just payments, profits or bribes, though all of those are emoluments that have been known to flow to office-holders. Emoluments also include advantages, opportunities, and what today we would call sweetheart deals. “The Trump hotel lease in D.C., and the federal government’s planned lease of space in Trump Tower in New York both implicate the domestic emoluments clause, as does the Trump Organization aggressive plan for expansion within the U.S. that will entangle the company with every level of government as they seek zoning, construction and environmental permits, approvals or waivers, as well as tax breaks that often accompany development plans. Less than a month since President Donald Trump took office, Free Speech For People and RootsAction.org are “delivering a petition with more than 850,000 signers to Congress calling on the House of Representatives to initiate an impeachment investigation into President Trump’s corrupt business dealings, including violations of the U.S. Constitution’s foreign emoluments and domestic emoluments clauses and other federal law.” For more information on the petition, visit: ImpeachDonaldTrumpNow.org. The press conference at the National Press Club at 9:45 a.m. on Thursday will be followed by presentation of the petition at the U.S. Capitol at 12:15 p.m.(details to follow). Speakers will include Ben Clements and Ron Fein of Free Speech For People and Norman Solomon of RootsAction.